Industrial Hemp seedlings grow in the Hawai`i test patch. 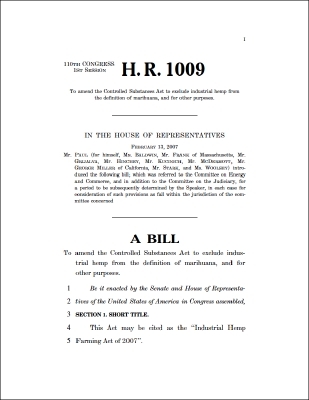 The "Industrial Hemp Farming Act of 2007"
Welcome to the IndustrialHemp.net web site Utne magazine readers. I have added a new question to our FAQ. It is really two questions and they are the ones that I am asked most often now: What can I do to make a difference? How can I help? The answer is: There are many things that you can do. In the end it comes down to two things: education and money. People need to know about hemp and its usefulness and buy hemp products. Please take a look at our updated Action Page for more ideas. The Journal of Industrial Hemp is the hemp industries' peer reviewed journal. It is a great resource and well worth reading. We work very hard to bring quality, up to date information on the subject of Industrial Hemp to our readers. We hope that you enjoy the work we put into it. For running commentary on hemp news around the world and all things related to hemp please see our new blog at The Hemp Report. 1. Q: What is Industrial Hemp? 2. Q: What is marijuana? A: Marijuana is a preparation made from varieties of Cannabis sativa L. that are intended for medical and recreational drug use. They are grown for their THC content, primarily in the flowering tops and to a lesser extent in the leaves. Cannabis sativa L. grown for marijuana is characterized by being high in THC (delta-9 tetrahydrocannabinol) and low in CBD (cannabidiol). The THC content is greater than 1%, usually 3% to 20%. The ratio of CBD to THC is less than one. 3. Q: Is Industrial Hemp marijuana? A: No. Even though they both come from Cannabis sativa L., the varieties that are used to make Industrial Hemp products (seed, fiber, etc.) and those that are used to make marijuana (flowering tops and leaves) are distinctly different. They are scientifically different and are cultivated in very different ways. 4. Q: What can I do to make a difference? How can I help? A: There are many things that you can do. In the end it comes down to two things: education and money. People need to know about hemp and its usefulness and buy hemp products. Please take a look at our updated Action Page for more ideas. 5. Q: Is industrial hemp illegal to grow in the United States? "Currently it is illegal to grow hemp in the United States without a special Drug Enforcement Administration (DEA) permit being issued." "Strictly speaking, the CSA does not make Cannabis illegal; rather, it places the strictest controls on its production, making it illegal to grow the crop without a DEA permit." Growing hemp is kind of like driving, you can't drive without a license and you can't grow hemp without a permit. The difference is that it is almost impossible to get a permit from DEA to grow hemp. An excellent example is John Stahl, of The Evanescent Press, and his DEA permit story. 6. Q: What is hemp oil? A: Hemp oil, or hemp seed oil, and cannabis flower essential oil are not synonymous. Hemp oil is legal in the United States and cannabis flower essential oil is not legal. Marijuana flavored lollipops and candies are not flavored with hemp oil, they are flavored with cannabis flower essential oil. Hemp oil is not used as a flavoring. Hemp seed oil is a vegetable oil that tastes much like safflower oil. Hemp oil is legal and is exempt from the definition of "marihuana" in the Controlled Substances Act 21 U.S.C. 802(16). 7. Q: What is cannabis flower essential oil? A: Cannabis flower essential oil, which smells like fresh marijuana buds, is used like other essential oils is used to flavor foods, candies, and beverages It is also used as a scent in perfumes, cosmetics, soaps, and candles. It is also known as cannabis flower extract, hemp essential fragrance, essence of hemp, or as hemp essential oil by those in the trade. It is incorrect to refer to cannabis flower essential oil as "hemp oil." Cannabis flower essential oil is produced exclusively from the flowering buds of Cannabis sativa plants by low-pressure steam distillation. It requires about 50 pounds of flowers to produce 1 ounce of pure oil. Cannabis flower essential oil is produced mainly in Switzerland, England, France, and The Netherlands. It is not produced in the United States. Because it is made from the flowers cannabis flower essential oil is not legal in the United States is considered to be "marihuana" in the Controlled Substances Act 21 U.S.C. 802(16). Products, like candies and lollipops, that are made with Cannabis flower essential oil are considered to be "marihuana" and are not legal. High quality writings from a man who knows his stuff. Dr. West holds a Ph.D. in Plant Breeding from the University of Minnesota and has been an applied plant geneticist for 25 years. Since 1993 he has served as an advisor to the emerging Industrial Hemp industry regarding Industrial Hemp germplasm. This is real research material. Dr. David West in the news. The story is about the Hawai`i Industrial Hemp Research Project. This is a must read for anyone who is interested in Industrial Hemp! Botanically,the genus Cannabis is composed of several variants. Although there has been a long-standing debate among taxonomists about how to classify these variants into species, applied plant breeders generally embrace a biochemical method to classify variants along utilitarian lines. Cannabis is the only plant genus that contains the unique class of molecular compounds called cannabinoids. Many cannabinoids have been identified, but two preponderate: THC, which is the psychoactive ingredient of Cannabis, and CBD, which is an antipsychoactive ingredient.One type of Cannabis is high in the psychoactive cannabinoid, THC, and low in the antipsychoactive cannabinoid, CBD. This type is popularly known as marijuana. Another type is high in CBD and low in THC. Variants of this type are called Industrial Hemp. Reality: Feral hemp, or ditchweed, is a remnant of the Industrial Hemp once grown on more than 400,000 acres by U.S. farmers. It contains extremely low levels of THC, as low as .05 percent. It has no drug value, but does offer important environmental benefits as a nesting habitat for birds. About 99 percent of the "marijuana" being eradicated by the federal government-at great public expense-is this harmless ditchweed. Might it be that the drug enforcement agencies want to convince us that ditchweed is hemp in order to protect their large eradication budgets?